I’ve been asked to write about my and the band’s experiences since starting the Parade Street Dixieland Jazz Band back in April of 2008. Have you ever seen the TV ad for AARP with the guy getting into his car saying, “When I grow up I wanna start a band?” Well here’s my “grown up” story and the four factors that influenced me to start the band. Isn’t it natural…for every seventy-five year old retired high school principal to want to start a band; for a man who was and is happily married to the same woman fifty-one years at the time the band was started; for a man with three grown children, eleven grandchildren, one great grandchild; for a man who has been a laryngectomee since 1997; for a man who has never had a formal music lesson in his life; for a man who is a self-taught tenor banjo player and who always thought that the circle of fifths was simply a bunch of 12 empty Jack Daniels bottles spread around in a circle? Isn’t that how all bands start? My love and appreciation for music played Dixieland style goes back to when I was in the service during the Korean “conflict”. My best buddy was from “Nawlins”. 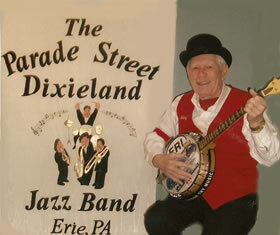 Since coming to Erie in 1970 my only local source to satisfy my appreciation and love of Dixieland came from Don Haener and his Dixie Doodlers. I have the greatest respect and admiration for Don and his group, as they have stood the test of time. Don and his group was one of the contributing influences that made me want to start my own Dixieland jazz Band. The second influence came in 2002, after my wife and I went to see one of the traveling road bands from Preservation Hall in New Orleans at Mercyhurst College. The house was packed, and all through the band’s performance, I saw heads bobbin’, heard toes tappin’ and hands clappin’. For the last song, the band played “Saints” and with that, the melody line and banjo player came down off stage and started a parade around the hall and took all the folks following them back up on stage. That’s fun music. The third influence was a combination of events starting in 1997 when I became a laryngectomee. I taught myself to talk without any mechanical devices and started teaching myself how to play a tenor banjo. Learning the basics, I decided it was time to “come out of the basement” and joined the local Lake Erie Banjo Jammers. Gaining more banjo skills and self-confidence, I joined the Pittsburgh Banjo Club. With the Pittsburgh Banjo Club, I had the opportunity to play Chautauqua in 2001 to a standing room only crowd in the Amphitheater of over 5,000 toe tappin’, head bobbin’,hand clapin’ folks having a ball, and dancing in the isles. Back in ’04, I had an idea to share my new found banjo skills with inner city kids and with the help of Ms. Mary Alice Brown we started the JFK Inner City Youth Banjo Band. Within a year, a documentary producer from New York City, who was working on a documentary about the history of the banjo in America, heard about our program and flew to Erie to see what it was all about. After seeing what we had, she made our JFK banjo program the “ending statement” for her banjo documentary. That was the fourth factor that influenced me to start my own Dixieland jazz band. Not having any contact with “regular musicians”, I got some help from the good folks with “Showcase” and the Senior News publication and they put in a brief mention of my new effort in their papers. Those small mentions brought in a clarinet player, a sax player and a beginning trumpet player. Needless to say the effort didn’t last long. Discouraged, an associate suggested that I join the Local 17 AF & M Union where I could have access to all the local union musicians. I joined and immediately sent a letter out to every musician in the union who lived in the area that played a trumpet, clarinet, trombone, drums, and tuba and keyboard. One key point I had in the letter, was that those interested had to agree to leave their egos at home and come to play and have fun playing music Dixieland style. Within a short period of time I was able to put together a “team” consisting of Dr. Gary Viebranz,, John and Marilyn Marszalek, Keith Lenz, Kent Tucker and Jim Bauman. Today we have the same folks and we are entering our fourth year and it looks like 2012 will be our most successful year. We have all stayed together; we are a team that has fun playing music Dixieland style; that is the secret to our success. I had to learn many things quickly playing with professional musicians. The most important lesson was to how to transpose music for the Bb instruments. I turned to Bill Reese, a banjo playing friend, for help and holed up in my basement for a period of time and transposed some 30 plus tunes. Never having negotiated for a gig, I was fortunate to have some friends on the Board of the Erie Summer Festival of The Arts and they gave us our first play date in 2009. I learned quickly that venues in Erie were basically $300 events, maybe an occasional $400 event. I also learned quickly that the phrase “opportunity for exposure” were code words for “FREE”. Being a new group we realized that we had to take the money as it came in order to create and develop a musical niche and demand for our band. If you want to get on our 1,750 member e-mail Newsletter list, contact hrraldrich@gmail.com. In summary, our success so far is a combination of factors such as having quality musicians who are willing to leave their egos home and have fun playing fun music, being able to communicate our music to our audiences so they have fun too, and having a persistent, quality, marketing program. Come see us and hear us and say hello. You can learn more and contact us through our website, psdjb.webs.com. Here is a montage of the band’s work, from the Erie Summer Festival of the Arts, 2010. We hope oyu enjoy it.